Brad's Grandfather Rush Leftwich and Great Uncle George c. 1962. Brad’s grandfather, a banjo player, and his great-uncle, a fiddler, came from Fancy Gap, in the Blue Ridge Mountains of Carroll County, Virginia; the nearby towns of Galax and Mount Airy attest to the area’s reputation for traditional music. In the early 1900s they moved to Kansas with their families to become tenant farmers. 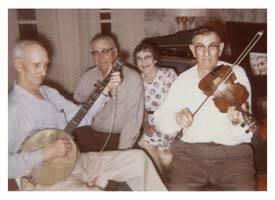 Brad’s father, an old-time singer and guitar player, was raised on the farm near Burden, Kansas, and Brad first heard old-time fiddle and banjo played at family gatherings there. He learned to play guitar from his father and absorbed most of his dad’s song repertoire in childhood. Brad started playing banjo at age 15 and took up fiddle a couple of years later. Since his grandfather and great-uncle had died a few years earlier, he sought the roots of his family’s musical traditions in the southern Appalachians. 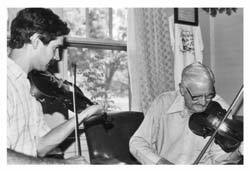 In 1973, at the age of 20, he met the man who became his most influential mentor, the legendary fiddler Tommy Jarrell of Mount Airy, North Carolina. Tommy’s mother-in law was a Leftwich, and in the liquor-making days of his youth, Tommy had a still near the Leftwich home in Virginia and played music with a brother and sister of Brad’s grandfather. Brad with Tommy Jarrell, 1984. Photo by Linda Higginbotham. For the next two decades, Brad continued to seek out and learn from musicians in the Appalachians as well as in his native Oklahoma, the Ozarks, and the Midwest. In 1979, he moved to Bloomington, Indiana, where he resides with his wife and musical companion, Linda Higginbotham. Over the years he has played with a variety of bands, including Plank Road, Leftwich & Higginbotham, the Humdingers, and Tom, Brad & Alice, and the Hogwire Stringband. Today, Brad is one of the foremost old-time musicians in the United States. 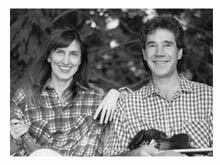 He is especially regarded for performing and teaching authentic, traditional-style fiddle and banjo. He is a frequent staff member at music camps and counts the late country music star Buck Owens among enthusiastic students of his instructional videos.